When you decline the "advances" of a stunt coordinator or stuntman and then he keeps harassing you when you don't comply----they can and will try to make you look bad and even hurt you on the job---the are master's at making thing's look like an accident. These are not "men" and they should be run out of our Industry. You have a voice—you must speak up. Email me at [email protected] stuntwoman.net if this is happening to you. My name is Julie Ann Johnson and I have been a Hollywood stuntwoman my entire adult life. I was blacklisted in my prime for complaining about safety issues, discrimination and drug abuse on the job. One of our beloved production managers, Abby Singer, once said to me when I was first starting out, ‘Julie, this industry is going to chew you up and spit you out.’ Well, they did just that. When I asked him why, he said, ‘Because you’re kind, thoughtful and considerate.’ Well, he was right. They spit me out without a second thought. But now I’m back, because you can’t keep a good stuntwoman down. I am currently collecting data and first-hand accounts of the status of stuntwomen around the world, and what I’m finding is as appalling as it is enraging. Sadly, the stuntwomen of the world face the same problems that stuntwomen have faced here in the United States for decades: Sexual harassment, bullying, threats, stalking, and attempted rapes and rapes. And if they complain, they are blacklisted. For the most part, the perpetrators go unpunished, and keep repeating their abuse because there is nothing, and no one, to stop them. I would like to change that. Guidelines and rules are not good enough. The status quo is not good enough. The law is not protecting us. The only way to stop these abusers is to identify them and shame them. 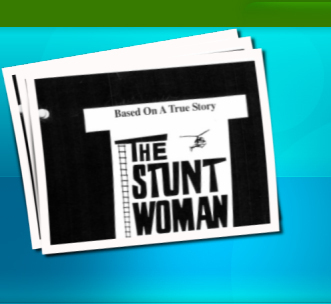 To that end, I welcome stuntwomen from around the globe to email me at [email protected] and I will post your stories, anonymously if you prefer, on my website thestuntwoman.net, and bring these abusers to the attention of the world media. If our global stuntwomen want to stand up, I would like to hear from them. Together, we can stop this epidemic of abuse. United we stand, tall and proud. Divided we remain in stagnant waters to drown alone. I say there’s a special place in hell for men who don’t heed this warning. I encourage women outside of our movie industry to support us; you are more than welcome to join our cause. If this industry thinks it can continue to abuse the best stuntwomen in the world, they should be prepared to get out their big fat wallets and checkbooks. THIS ABUSE MUST END. It’s been said that “the only thing necessary for evil to triumph is for good men to do nothing.” I say that the only thing necessary for evil to triumph is for good women to do nothing. I welcome women in the print and broadcast media to support us, and to help us expose the abusers in our industry. It will take their voices to help us put a stop to this abuse. I also welcome a fearless filmmaker who has the courage of a mother lion protecting her cubs to step forward and document the true and shocking story of the rise and fall of the global stuntwomen. We have entertained you for decades. Now let us enlighten you. I'm a little old---I'm a little beat up---I'm a little shy, but when I hear about a stunt woman being hurt "purposely" on the job or blacklisted for her opinions....you will hear me all the way around this earth. The so called "Hot Line" we are told to call is a joke! The so called "hot line" we are told to call is a joke! You want to commit professional suicide? Call the "hot line"---your career is over. The PERPETRATOR gets a slap on the wrist and then goes back to his buddies and says, "I got turned in, so don't use that person any more". You are burnt toast...no matter how good you are. To the women in our Industry, in all phases, who are "silent". It's the women who are not afraid to stand up and speak up who keep you working! You should appreciate the hell out of us....we are the one's who have guaranteed your positions. Maybe you can find the decency to say a "silent" Thank you. Survey means: To look over.....to see more. To examine as to condition. To query someone in order to collect data. A survey needs to be transparent to all....not hidden. What good does it do to hide the findings? If you hide it......I guess the truth hurts too much.